All malls which bear the name Galleria are modeled, in theory at least, on the Galleria Vittorio Emmanuele, a four-story glass-enclosed mall in Milan, Italy. South Bay Galleria is no exception. Opened in 1985, South Bay Galleria appended a 3-level modern mall to an existing Robinson’s-May location which had operated as a department store in some capacity for three decades prior. The other anchors at South Bay Galleria are Mervyn’s and Nordstrom, and the mall is located in Southern California’s South Bay area at Hawthorne and Artesia, very near the 405 freeway and about 15 minutes south of LAX airport. At some point the mall was called Galleria at South Bay, but that changed somewhat recently. South Bay Galleria is most unique for offering a bit of everything to everyone. While most malls trend toward value, mid-tier, or upscale, they often don’t break that character and South Bay Galleria does. From Ann Taylor and Banana Republic to stores like Bling It, even the anchor stores have variety. Mervyn’s is a discounter much like Kohl’s, while Nordstrom is decidedly upscale. 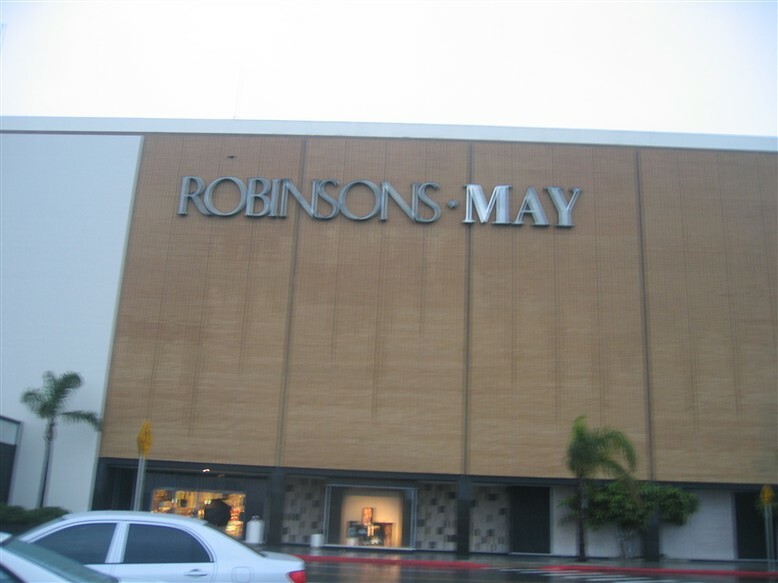 In 2006, Robinsons-May became Macy’s following Macy’s buyout of all May company stores. As for its decor, South Bay Galleria is much like the Milanese shopping mall from which it bears its name. It’s full of natural light, glassy, and modern. In fact, during 2004 it was given a major refurbish to rid itself of most of the 1980s decor; however, a neon sign or two still hangs despite the re-do. 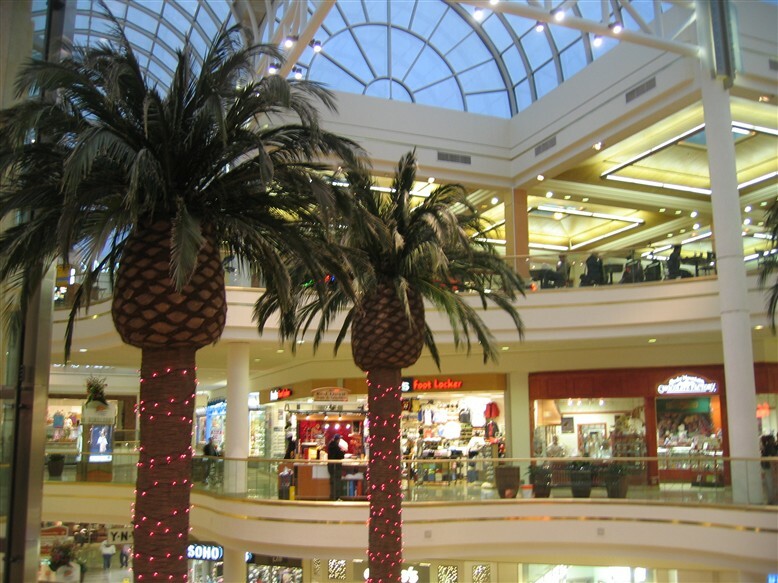 In addition, South Bay Galleria has been a popular film location through the years. Portions of movies such as Fat Albert and scenes from popular television shows like Disney’s Even Stevens have been filmed here recently. 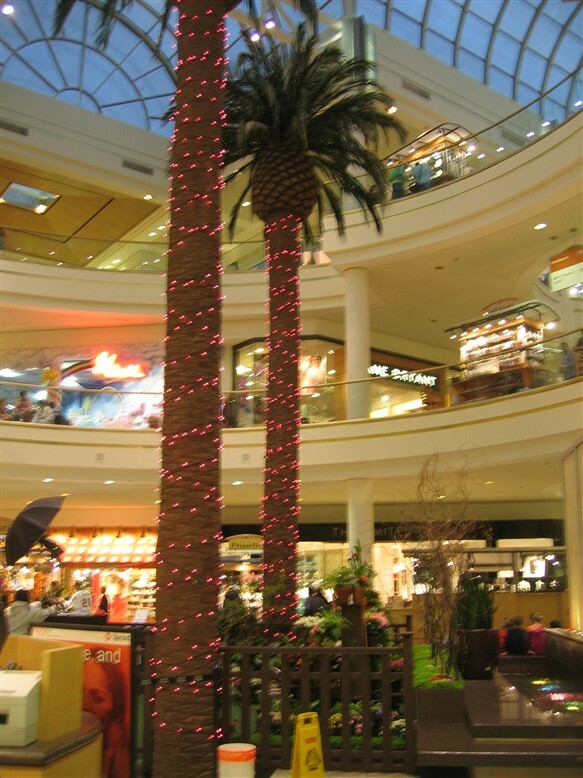 We visited South Bay Galleria in March 2005 and took the pictures featured here. Let us know more about the history of the center or post your own experiences. The South Bay Galleria is also notable (at least in my mind) for having the closest Chick-fil-a location to Downtown Los Angeles. I know that’s the only reason I end up there. At the least, it appears to be very warm and inviting. There must be more dominant malls and shopping venues in the vicinity keeping this mall from having a more upscale roster of tenants. This mal has a beautiful interior. Glad to see the palm trees are still there. So many malls of that vintage have removed them. Del Amo Center in Torrance is the closest mall to the Galleria, but it is not an upscale mall at all, and South Bay Galleria is closer to the freeway (I-405) than Del Amo, which is always a plus in SoCal. South Bay LA is not as affluent as the Westside (except the Palos Verdes area, where there is an upscale shopping center), where the more upscale malls are. South Bay is a mostly solid middle-class area. That would be the Del Amo Fashion Center with 2.5 million square feet of space. Originally, this was pretty much a free-standing May Company store (c1959). There were some other businesses (like Ralph’s market) but the first traditional mall in South Bay was Del Amo Center, which opened a couple of miles south of the May Co, around 1961, and had The Broadway, Sears, and Penney’s. Then in 1966, Bullock’s Fashion Square opened across the street featuring Bullock’s and I. Magnin. In the 70’s, Ohrbach’s and Wards opened up but the two centers operated separately. Then in 1981, the two Del Amos were joined with a Robinson’s built in the middle. To get from the Bullocks mall to the Broadway mall you literally walked right through Robinson’s. At this point, Del Amo became the largest mall in the world under one roof, with 8 anchor stores. The lowly May Company sat all by itself, up Hawthorne Boulevard from Del Amo. The catalyst for developing the Galleria at South Bay was Nordstrom’s desire to open a store. The new center extended north and south from the huge (5 level) May Company with Nordstrom on the north and Mervyn’s on the south. Opening in 1985, it was nice and compact (compared to the sprawling, unwieldy Del Amo) and its design allowed plenty of natural light. Over the years it attracted more upscale stores such as Williams-Sonoma, Polo, and Sharper Image. One unique feature is an escalator which takes hungry shoppers directly from the street level to the third floor food court, bypassing the middle level entirely. Over the years, the loss of Bullock’s, I Magnin, Robinsons, Ohrbach’s, Wards, and The Broadway from the market has left Del Amo with some big empty boxes to fill and stores like TJ Maxx, Burlington Coat Factory, and Marshalls have opened there the void. 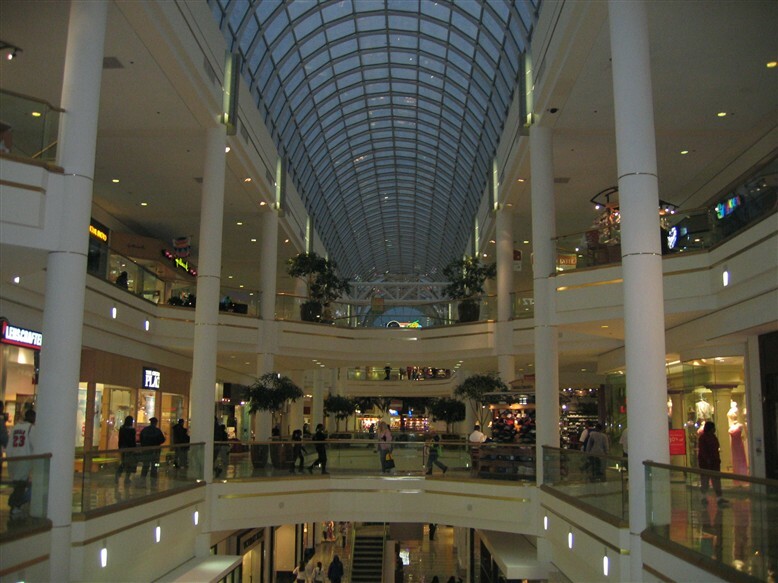 Consequently, South Bay Galleria has emerged as the dominant, ‘better’ mall in the area. Robinsons-May closed off the basement level sometime during the 90’s. It was only 4 levels and not 5. The basement is still there and the Escalators down are tackily covered by drywall. Quote: Over the years, the loss of Bullock’s, I Magnin, Robinsons, Ohrbach’s, Wards, and The Broadway from the market has left Del Amo with some big empty boxes to fill and stores like TJ Maxx, Burlington Coat Factory, and Marshalls have opened there the void. Consequently, South Bay Galleria has emerged as the dominant, ‘better’ mall in the area. Del Amo is going through a renissnace. Broadway became a 2-level Macys Home (level 2 and 3) and on the first floor a Jo Anns Etc. Wards (and the entire wing from Ohrbachs to Wards) was torn down for a new lifestyle wing with a Lucky Strike and an AMC 18 theatre. Future plans include a complete remodel of the mall, conversion of the former Robinsons-May (Now a temporary 2nd Macys location) to shops, and the upper level from Robinsons-May to the Macys home a new food court and restaurants. Recently, Del Amo and Macy’s announced that they would swap properties. Macy’s will get the former Robinsons-May store, and refurbish it as a “Macy’s Men’s and Home Store”, whilst its current home (former Broadway) will be future home for retail. However, JoAnn’s Fabrics will remain on the lower level. I’m thinking that Burlington will relocate from the basement store, or have Dillard’s in the South Bay (preferably replacing the original Nordstrom in the Galleria). Architecturally (interior) this is one of my favorite malls in Southern California. Mainly because it has beautiful skylights and 3 levels malls are becoming inreasingly rare in this area. I am also drawn to the 80s-ness of the exterior Pompidou wannabe escalator up to the food court. The rest of the exterior is fairly plain and could use a facelift. Especially the very dated Mervyns exterior. The Mervyns inparticular has always looked odd because it is just 2 levels and is dwarfed by the giant May Company (Macys) and the remainder of the 3 level mall. The great thing about this mall is that it there is very little distance between the 3 anchors, and tons of escalators, stairs and ramps. The compact, 3 level design works really well. If you’ve been to the largely one-level Del Amo you know just how much walking there is to cover the whole mall. Besides the great function/interior architecture, the tenant mix is mall standard/not terribly exciting. Also worth mentioning is that an AMC theatre complex was built ontop a pre-existing garage around 1999 (I think, can anyone verify?). This is actually located on a 4th level, with escalators from the third floor leading up to it. It’s great to see a southern california mall mentioned! I hope you guys getting around to doing the ever-interesting “Shops at Palos Verdes”, Del amo, Manhattan Beach Mall, Montclair Plaza, and Sherman Oaks Galleria. I’m free falling! This mall was featured in a Tom Petty video. Looks pretty much the same from when it was built in the Eighties (last time I was there.) At the time, I was on my way to Del Amo. Having no idea what it looked like, we first stopped here. No, not it. Then we ended up at Old Towne Mall, which also wasn’t it. Finally, we made it to Del Amo. I picked up 6 new credit cards that day! They gave them away like tissues during allergy season and were far more giving than northern California retailers, who all denied me. Who could forget the uninvited cologne spraying while walking through Robinsons? Thanks for posting this.. brought back lots of memories. South Bay Galleria is definetly a nice mall but in my opinion the management and security is over their heads with egos. Their attitude towards the tenants and a hint of discrimination against the shoppers makes me drive a few miles more to shop @ Del Amo or the Manhattan Village. I’ve seen security taking sides during incidents and management overlooking the mistakes of some tenants. One recent incident comes to mind, a decent looking fella was minding his own buisness when he accidentally bumped into a obese teen. The teen right away accused the poor guy saying he grabbed my breasts and started beating up the guy. While the guy is trying defend himself BAM! One of the Sprint employees clocks the guy.. yeah the guy who was already taking a beating. Security shows up after 5 mins and starts going at guy with all the questions. While one of the security is laughing with the obese teen and the Sprint guy about how accurately he hit the guy right the face. Few minutes later witnesses walk up to security, telling them that the poor guy is not at fault. Security’s response? ” We got it Sir/Mam, please continue with what ever you were doing”. Few minutes later both the fat teen and the Sprint guy walks away and the still the Security and the Redondo Beach police who are on the mall pay roll are warning the guy about what will go down if it happens again…. WTF! Is all I can think of at that time. I hate to rain on the parade but the mall featured in Tom Petty’s Freefalling is actually the Westside Pavilion in West LA. This is about 10 miles north of the South Bay Galleria. It is an honest mistake though as both malls have similar skylights. The exterior of Westside Pavilion, the escalator to the rooftop parking and the straight-shot design are clearly visible in the video. The Westside Pavilion was also originally just a 1950s era May Company, a supermarket and a strip of shops. 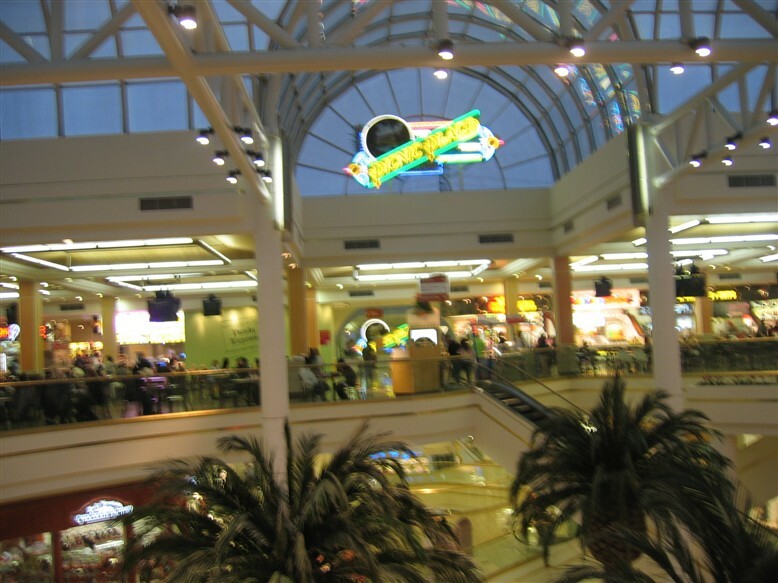 The 3 level mall was built between 1983 and 1985. The catalyst for this development was also Nordstrom, who was originally going to open in the Century City Mall. This center was very popular in the 80s and 90s and a bizarre new outdoor wing opened in 1991. This wing was also 3 levels, but across the street and connected only by a bridge on the 3rd level of Nordstrom. This new wing was a mess compared with the elegant 1985 addition, and was gutted in 2004 to make way for a new movie theatre complex (due to open next year). This mall is pretty notorious for its incredibly poor-designed parking structure. I’m not sure if this structure was a holdover from the earlier pre-mall days or built specifically for the 1985 addition. The design of the structure looks very late 60s/early 70s to my eyes. This is also one of the only malls in California to have parking directly above the entire center. Today this mall is in slight decline due to the success of The Grove, and the renovation of the Century City Mall. Oh no! I’ve been telling everyone that I’ve been there! Ha! in my experience, the galleria at south bay is a horrible mall. granted, it used to be nice, but the clientele has changed since the hawthorne mall closed down and shifted an ‘unpleasant’ element towards redondo beach. the nordstrom used to be really high end but the decline can be attributed to nordstrom decinding the quality of each individual store. they have a, b, and c stores. a being the most upscale and the most rare (the grove, south coast plaza, san diego) and c being common (cerritos, south bay, santa ana). nordstroms all uded to be really upscale, but mall demographics and economics forced a re-evaluation of product distribution. as mentioned before, there was a ralph lauren store, a laura ashley, and several other nice retailers, but now due to a shift in shoppers, the nice stores left and they were replaced by those gypsy shops that open up in an old gap but don’t make any changes to the interior so it still looks like a gap. also, the galleria is not the safest mall to be in at night. i used to work at nordstrom and there were shootings in the parking lots, a stabbing at christmas and a gang throwdown at the coffee bar outisde the second floor enterance. store security shut all doors to the mall and locked them until mall security and the police took care of the problem. del amo is my new hang out. they have done their remodel and the new wing is beautiful and the stores target a newer more affluent demographic. they opened anthropologie, urban outfitters, z gallerie, lucky strike lanes, pf chang, lazy dog cafe, anne taylor loft, j jill, eddie bauer (who left south bay) guess, levis, lucky jeans, new york and co, free people, sunglass huts new upscale sgh and johnny rockets plus the 18 screen theater and a parking garage you can actually navigate. i’m nto sure what theyw ill do with the old robinson’s. its a macys now, but tis just got a silly banner over the old robinsons sign and there’s nect to no merch on the floor. if they do close it and open more shops that would be great. Is this the mall they went to at the end of Superbad? I know the mall shown at the end of the movie Superbad was some mall owned by Westfield(I clearly remember seeing a Westfield logo inside whatever mall they were in, during this part of the movie). So, unless Westfield owns South Bay Galleria(which I somehow doubt they do), it probably wasn’t this mall. Hey, Sean, I agree with allof your mall chocies,esp.Fashion Island. I’ve been after forever early pics of that innovative mall! This mall is not really safe. Over the years average middle class to upper class people have been shot there. One story that stands out in my mind was an older woman who got pulled out of her mercedes and shot and killed for it. I will not go there after dark. I will not drive in anyone’s “nice” car to go there. The parking is really poorly designed, and it is impossible to get in and out during the pre-Christmas shopping period. @Lees, wow upper and middle class people have been shot at the Galleria and where did you get this untrue information from your mind. State facts only. You are so far outhere that is all i have for you. I agree with you Leees. This place is getting worse day by day. The other day I was there X’mas shopping with family. While leaving the mall in their open parking structure a middle aged women was going to her car. 3 guys just drove next to her, 2 jumped out of their car punched the poor lady in the face took her shopping bags, wallet and purse. And just drove off. I was already in my car with family in the lane next to where this took place. Next day I came to return some stuff. Asked one of the security guys about the incident. Come to find out she had a lot of cash on her and was driving a brand new car. And she had to be taken to the ER for the broken nose. I also know some of the tenants of this mall. They are tired of all this. Security seems to be a tad lazy at times too (according to them). We really like this mall because of Nordstorms, CPK and Red Robin. But its just getting to a point where I don’t feel safe to take my family here or let them come here by themselves. Other malls have these kind of problems too but this seems to beat them all in all the crimes that has happened in or around the mall. Wow! I just checked the tenant list and this mall has a lot of upper end stores, especially with Nordstrom’s as an anchor. It does not seem that such an upscale mall would have that kind of crime, and so out in the open. I know nothing about this city or county demographics, but if the area of town has crime that bad, how is a mall with this many upscale stores sustianable in that part of town? It is a wonder it is not a more middle of the road mall or a half dead mall. What a shame such horrible crime seems to curse this mall. It is a beautiful mall, the skylight is stunning. That’s a horrible story Tom, I can only imagine what other crime takes place at this mall. To me the mall is nice looking. There’s a mall here in Michigan (The Somerset Collection) that’s a Galleria type mall as well. It’s got the same skylights and lighting, only difference is that TSC has a skywalk, a seperate upper-end mall and fountains, but the similarity is still there. I was shopping in the ladies sportswear department upstairs in Nordstroms in the Redondo Beach Galleria right after Christmas when I was approached by a man claiming to need $16.20 to pay a tow truck driver in the parking lot. I told him no, and he disappeared into the racks. Yesterday my husband and I were approached by the same man with the same scam story in the parking lot that the Galleria shares with the Expo home improvement store as we parked our car. I am convinced that The Galleria Mall is a dangerous place to shop. That’s really too bad…South Bay Galleria seems like a cool idea…a beautiful three level mall, with stores that appeal to everyone…but the crime is a problem. The neon removal too…that’s a shame. Avoid the movie theaters! Cell phones, teenagers, bad scene! Trust me–never see a movie here. Any pictures pre-remodel? I love the neon! I no longer shop at this mall. It’s dangerous and full of gang members and drug dealers. There is no security visable at this mall at all. The Nordstroms has cheap and pathetic merchandise – KMart quality if you ask me. Yes, I agree with all the comments regarding the parking. The garage is ridiculous to get in and out. People…please go easy on the crime thing….this mall is not more dangerous than any other mall in So Cal….the majority of people that shop here are from Torrance, Redondo, Hermosa, and Manhattan beach cities. Not a threatening crowd, hence all the upscale stores on first level. Plus there is a killer AMC theater which was added a couple of years ago. This mall is not the best, but I must say it does the job. Ok…I have been going here for MANY years…by myself, with my family, with my friends, daytime, nighttime. I have NEVER had a problem in the mall, the parking lot or in the movie theatre. They just opened up a Kohl’s and it’s wonderful. I love going to Red Robin. Chik-fil-a is an added bonus. It’s really beautiful during Christmas time. If you haven’t been here in the past few months, come back. Or even come back after Christmas when the rush isn’t as bad. No…I do not work at the mall…I just love this mall, the atmosphere, the variety. Very friendly and inviting. I came here hoping to find pics and stories of what this was BEFORE it was South Bay Galleria… in the 1950-70s there was an open air shopping center called South Bay Center, and it was amazingly atomic-age looking. No one seems to remember it or have pictures. The May Co is the only part that remains. I have seen one photo of the exterior of it with JFK running for office giving a speech facing Hawthorne Blvd. But that’s it…. anyone? If anyone can find photos of this, we’d love to see them!!! @meestercranky, I visited this site for the same reason. We lived right up the street when I was a child and I have memories of having malts at the stainless-steel and linoleum counter of the Thrifty store coffee shop with my mom and brother. Also remember the free-standing Orange Julius. My mom used to shop at Zody’s, Woolworths, and May Co. I still have thread spools with store stickers intact that my mom purchased from these stores. Fond memories of a by-gone era (sigh). It appears that Nordstrom will relocate to Del Amo Fashion Center following a major renovation there. The store will open in 2015 following the expiration of its current lease at the end of 2014. 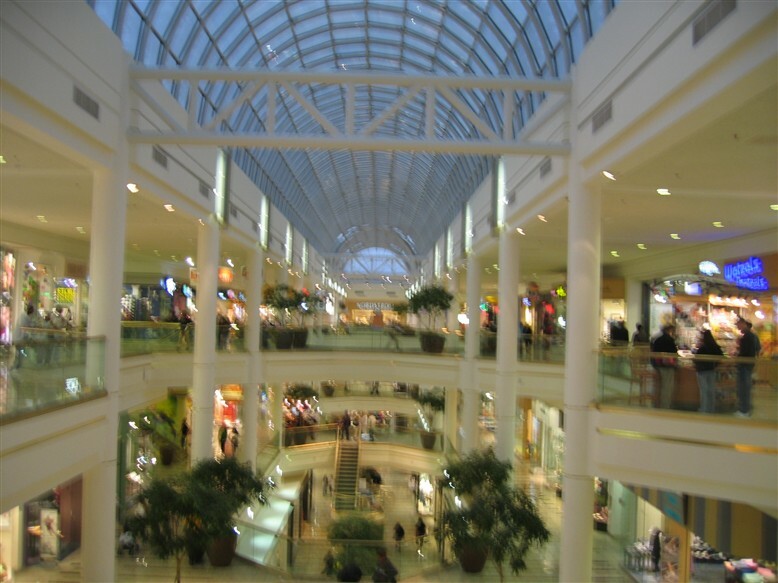 CLEVELAND—Forest City Enterprises Inc. said it has formed a venture with Australia-based QIC to recapitalize and invest in a portfolio of eight U.S. malls in return for $330 million of liquidity. Under the agreement, Forest City will contribute its current ownership interest in each of the properties to the joint venture and QIC will acquire 49 percent of those interests for cash. Upon closing, Forest City expects to raise cash liquidity of approximately $330 million, after transaction costs. Ownership of the individual properties, at closing, will vary based on existing partnerships currently in place at three of the malls. Forest City will be the managing member of the individual joint ventures and will continue to be responsible for leasing, operations, marketing, financing, development services and asset management of the properties. In a statement, Forest City officials said preliminary priorities for the joint venture will be renovation and/or expansion of four malls: Galleria at Sunset in Henderson, Nev.; Antelope Valley Mall in Palmdale, Calif.; Short Pump Town Center in Richmond, Va. and South Bay Galleria in Redondo Beach, Calif. The other properties included in the joint venture are Victoria Gardens in Rancho Cucamonga, Calif.; Charleston Town Center in Charleston, W.V. ; Mall at Robinson near Pittsburgh and the Promenade in Temecula, Calif.
Forest City values these properties at more than $2 billion. The company initially plans to use a majority of the liquidity from the transaction to reduce debt, but also expects to use a portion of the liquidity to fund the expansion and reinvestment initiatives referenced above, as well as invest in the balance of its mature real estate portfolio and new development opportunities in its core markets. “We are pleased to partner with QIC, an experienced global investor, to invest in and enhance these strong retail centers,” said David J. LaRue, Forest City president and CEO, in the statement. “This is another example of our strategy of securing strategic capital partners to invest with us in both existing assets and new opportunities.”. A simulation of the remoddled Del Amo Fashon Center. Nordstrom is relocating here from The Galleria at South Bay. Sad state for Horton Plaza.